Sixth graders Gage DeCarolis (left) and Tyler Abell (center) help Abbott and Gilbert pack boxes of food to give to families. This article was researched and written in collaboration with seventh grade job shadower Lily James. FARMINGTON - Students at Mt. Blue Middle School are addressing a need in their district by providing free food to anyone who wants it through an in-house pantry. 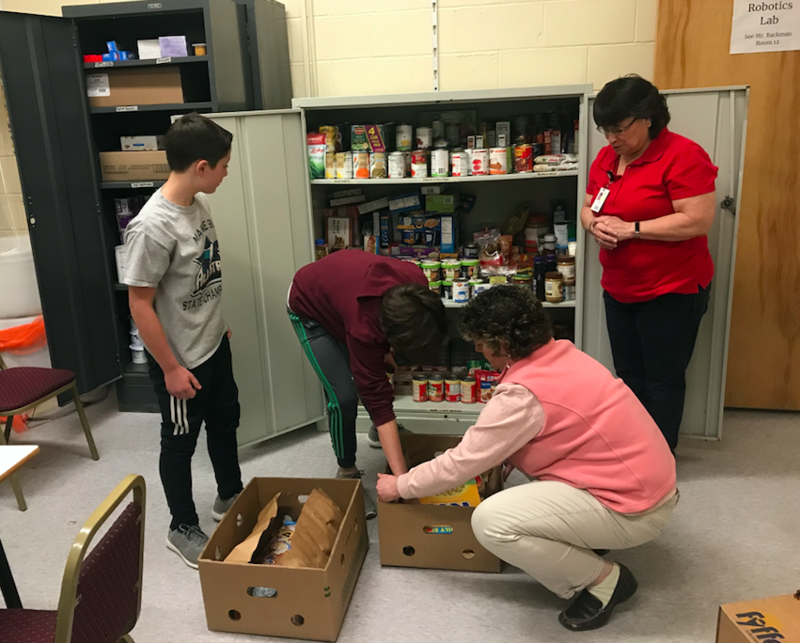 Principal James Black presented the idea of a school-based food pantry to staff members more than a month ago after hearing from School Nurse Suzanne Abbott about the need she was seeing. "It's huge. There's a lot of need and we're seeing it a little at a time as we get to know families," Abbott said. After two weeks of nobody taking the lead, seventh grade teacher Danita Gilbert volunteered. Gilbert said she had a number of students interested in helping with the project, and saw a good fit for the group. Once underway, the first step was roping in more student interest. A competition seemed the obvious choice. "How do you get kids excited about bringing in food?" Gilbert asked. The group decided on a competition. For every pantry item a student brought in, a ticket would be earned and a tally added to their grade level's cumulative number. The tickets were entered into a drawing for a variety of prizes, including donuts on the final morning of the competition. Gilbert said the interest among students has been huge. "This has been all kids," Gilbert said. Within two weeks the 540-student body compiled a pantry of 509 items, not including donations from Hannaford, Food City and Sodexo, the food supplier for the University of Maine at Farmington. With the help of social media, the pantry has attracted the attention of parents as well, raising nearly $100 from simply spreading the word. The pantry is also able to access the Mallett School food pantry as a resource- which is supported by Good Shepherd Food Bank. Both pantries are open to all RSU 9 students and families, with Mallett offering after school hours to access the free food. Abbott said they are also packing boxes to send home with families for vacation. "Vacation can be stressful for families," she said. To find out more or to donate to the Mt. Blue Middle School Food Pantry, call 778-3511. Wonderful community project. Kudos to the MBMS students.